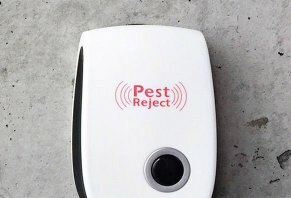 Ultrasonic Pest Reject Reviews - Is it a Scam or Legit? Claiming to be the number one rated pest-repelling device in America, the Ultrasonic Pest Reject claims to use low-frequency sound waves to drive away a variety of insects and rodents in your home, including ants, mosquitos, spiders, mice, and roaches. The device plugs directly into a wall socket, and its creators state that only one unit per average-sized room is needed. They go on to mention that larger areas such as attics, basements, garages, and large storage areas may require additional devices to work properly. The primary claim behind the Ultrasonic Pest Reject is that these low-frequency sound waves drive out pests without killing them, negating the need for messy cleanups in the process. The company behind the product states that it was developed by a Stanford scientist using military technology as a cheaper, non-toxic alternative to conventional pest control methods. This all sounds admittedly like a great way to keep your home clear and free from unwanted pests, to be sure, but is it really what you can expect when using the device in practice? In order to answer this question directly, we’ll need to zoom in and take a closer look at the technology underpinning it. As we mentioned above, the Ultrasonic Pest Reject relies on low-frequency sound waves that are beyond the hearing capabilities of humans in order to deter pests. They claim that these frequencies displace critters while leaving your pets and human counterparts unaffected, but is there any research to back this claim up? Interestingly, this kind of sonic deterrent has been around for quite a while, and as a result, there’s actually a fair bit of clinical evidence surrounding the technology. Though some trials have been promising in limited areas, the results have largely been mixed. For instance, in terms of rodents, one clinical trial found that though a sonic device was initially able to upset the creatures, they soon became used to the sound, eventually ignoring it outright. Another study found that cockroaches who had never been exposed to the sound waves were largely unaffected by them when using three different products (none of which were the Ultrasonic Pest Reject). Finally, a third study illustrated that ants and spiders were left completely unaffected by similar devices, except in a few rare instances. However, they go on to note that these cases of effectiveness might have been due to design limitations of the trial itself, as opposed to the real-world conditions you’d be more likely to encounter in your home. So, what does all of this mean for you in the end? Based on the sources linked above, the evidence is clear: the devices don’t seem to be very effective at deterring most of the insects and pests listed by the makers of the product at hand. In an interview with Buzzfeed, Texas A&M University entomologist Dr. Roger Gold (who has spent the better part of 20 years studying the effectiveness of sonic bug repellants) had this to say about the matter: "Based on the testing we have done through the years, the claims of repelling insects [with sound] are unfounded." But what about your pets? Will they be affected at all by the device? Ultimately, no specific sound frequency ranges are listed on the Ultrasonic Pest Reject website, and without this information, it’s very difficult to assess how likely your pets are to experience any discomfort from the product. We reached out to customer service to try and clarify, but were unable to get ahold of an agent as of this writing. Shipping is listed as being free, regardless of which amount you purchase. As for the return policy, the checkout page lists that all orders are covered by a 90-day guarantee, less shipping & handling charges to get the device back to the manufacturer. Looking around on Amazon and Google, we were able to find dozens of different sonic bug repellent devices available for purchase, many of which featured strikingly similar design cues to the Ultrasonic Pest Reject. Some were so similar, in fact, that they featured the exact same design, with only the branding being changed. Interestingly, one such product made by Fiery Youth on Amazon was selling for $39.99 per six pack when we checked. Considering this is the price for just one Ultrasonic Pest Reject device, we think this is noteworthy. What’s more, there were over 1,000 reviews for the product on Amazon as of this writing, but upon further inspection, only a fraction of these were verified purchases, raising some suspicion as to the authenticity of the others. Outside of pricing and branding, however, there are a few other things you should look out for when considering making a purchase online. For one, it’s important to always consider any hard, relevant clinical evidence when evaluating the claims made by a particular company, as we did above for the Ultrasonic Pest Reject. Though we can’t categorically state that a product is ineffective based on this evidence (unless it was specifically used in the tests), we can at least get an idea of how similar technologies are performing. In addition, before deciding on a pest repellant device, it’s important to know what you’re up against. Because there is so little clinical evidence supporting this type of product, if you’re dealing with a full-scale bug infestation in your home, it may be wise to seek consultation with a professional pest control company before investing in any particular treatment option. Based on everything that we’ve learned above, can you truly expect the Ultrasonic Pest Reject to live up to its claim of being “the most reliable and technologically advanced” pest-repelling device on the market today? At the end of the day, without having tested the product for ourselves, we only have relevant clinical data and the reviews of genuine customers to use as tools when evaluating its effectiveness. Customer service was not available to provide any additional insight when we called, and as noted above, the majority of the clinical trials we encountered online seemed to report mixed-to-negative results when it comes to sonic bug-repellent effectiveness in general. When you couple this information with the high prices (relative to other products on the market), along with the suspiciously highly-rated, extremely similar-looking competition, as consumers ourselves, we’d find it difficult to rationalize a hasty purchase without knowing more. Instead, as we discussed above, it might be a better use of your hard-earned money to schedule a consultation with a pest control company directly in order to address the issues you and your family are facing in your home. Doing so will hopefully place you on the path towards an affordable and effective solution that works for you in the long run. I never was bothered by rodents (thank God! ), but I had scads of other unwanted creatures such as spiders, centipedes, and ants that I had to contend with. Well, by golly, with Pest Reject they've been banished from my life forever. I am truly grateful I made the investment in Pest Reject and I would recommend it to all my friends. We get roaches coming into the house from the garage every year and we have tried everything with limited results, until we bought two Pest Reject. It takes a little time to get rid of the roaches as they do not like the noise (we cannot hear it) and in three weeks we had no roaches. We tried it for ants but that did not work. I had a cockroach infestation that I couldn't get rid of. I tried all sorts of poisons which became vitamins to the roaches. Though I was skeptical of this device, I was desperate, so I bought one. Just one. My apartment has been free of roaches ever since I got this thing. I occasionally see a single roach wandering through my kitchen but nothing like before. I bought this last week and never received it. My grandson is a toddler and will be walking soon so we don't want snap traps or poisons in the house, especially on the floors, we now have no other alternative because I'm on a VERY limited income and can't afford to try to buy another one, my family lives with me and with mice in the house I worry for my grandson. This woman who refers to herself as "super mom" just because she works out of her home was emailing me and said there's nothing she could do for me because "it was delivered." Forget this. I'm warning everyone I can about this fraudulent company, done. I bought one because I occasionally see roaches and especially hate seeing them in the kitchen. After using it, I continued to see roaches with the same frequency in the kitchen where the device is plugged into the outlet. As I sit here watching my resident rat run right by two of the Pest Rejects, I have had all three out in a closed area for over a week. I wonder if I made the right choice to buy three of these things. I thought it was working at first. Saw a roach every now and then, but still seeing roaches. One was crawling in one in my son's room. He unplugged it and said it’s not working mom. Got a total of 12 for my house but it looks like I will start using the spray again. Very disappointed. I wish I would have read all this before my purchase. But today’s day one and I will update this in a few weeks and let y’all know. I kinda feel like the "Yes it works" people work for these people, lol. But ugh, I guess let’s see what happens. And if they don’t work, it is a nice blue night light. I’ll keep y’all updated. So my star rating it mutual and I just said yes because it might just work. I bought two of the Pest Reject items, saw them on Facebook. I had mice in my kitchen, set two traps I bought at Home Depot, caught one. So I bought the glue type, that caught three of them, and my dog got one. At last the Pest Reject items came and I plugged them in about three weeks ago. By the way, they got smart and avoid the glue traps now, saw them jump right over it. Every morning I have mouse droppings on my kitchen counter, sink, and stove. I clean it up every morning hoping not to see any the next day, but after three weeks and still cleaning mouse droppings, I feel I got took. I can't provide the order number to this review as my wife threw away the box with whatever information was in it. This thing is junk! It's a scam. I'm a clean freak. My neighbors have cockroaches, so I ordered one to be on the safe side because I'm terrified of a cockroach. I have never seen one in my house, but earlier today, there was a cockroach in it! What the heck. I threw it in the trash. The Pest Reject works, but it does take a few days to see the results. Yes, you will have the occasional pests show up, but you can generally expect about 90% positive results. One Pest Reject works for each room about twelve-foot square. What is more important is that you plug it in and leave it there. There is no need to continually spray and clean the area. When doing a "lowest price" sort on eBay for Pest Reject, you should find them for about $2.50 each. I have them in both my city and country homes for the last two years and I have no complaints. Write a Review for Ultrasonic Pest Reject!